With traditional hand papermaking at its core, Pulped Under Pressure underscores important contemporary issues steeped in history and craft. Enticed through touch, these works encourage a contemplative slowing down even as they urge acknowledgement of some of the most pressing issues (environmental crisis to global marginalization) facing civilization today. Each of the artists, Jillian Bruschera, Julia Goodman, Reni Gower, Trisha Oralie Martin, Melissa Potter, Marilyn Propp, Maggie Puckett, starts simply with a foundation of pulp made from natural fibers. Their multifaceted results incorporate a rich range of printmaking, letterpress, papercutting, and installation with a diversity of recycled disposable materials (junk mail, egg cartons, old cotton t-shirts, ripped denim jeans) as well as old bedsheets, beetroot, heirloom plants, and illuminated el wires. In very unique ways, these artists consider paper beyond its most common function as a passive surface of record or craft. Instead, the material is transformed and imbedded with content that turns communication into a public practice. 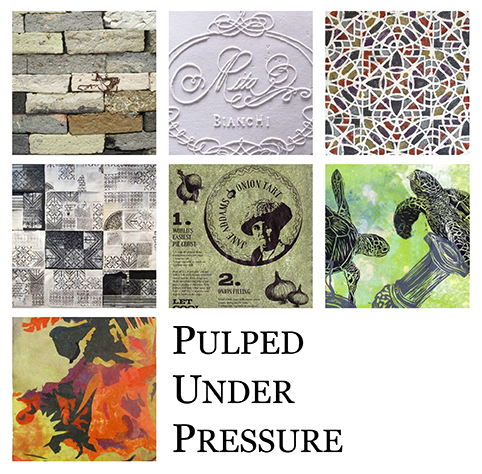 By challenging assumptions, the artists of Pulped Under Pressure create artworks that are both beautiful and brave. California native, Jillian Bruschera is an interdisciplinary artist who recycles discarded materials. By combining bits of broken technology (tv remotes, cassette tape, and cds) with waste paper and trash cardboard, the artist questions built-in obsolescence, over consumption, and identity. Based in Oakland, CA, independent artist, Julia Goodman makes cast paper works from discarded bedsheets and with papyrus pulped from beets. Loosely based on the history of rag paper, her biographical and biological approach produces works that are both fragile and strong. Professor in the Painting and Printmaking Department at Virginia Commonwealth University, Reni Gower incorporates sacred geometry in her spray pulped paintings and papercuts to reveal universal cross-cultural connections. Inspired by her heritage, Chicago artist Trisha Oralie Martin includes native Filipino tattoo designs and textile motifs in her highly patterned works. By archiving a practice that reflects a native people’s symbiotic relationship to the environment, the artist invites her audience to look, learn, and communicate despite differences. Influenced by crafters, feminists, and Quaker activists, Columbia College Chicago Associate Professor, Melissa Potter considers the radical history of women through traditional handicrafts, gender rituals, and untold personal histories. Chicago artist and co-founder of Anchor Graphics, Marilyn Propp examines the coexistence and clash between the industrial and the natural worlds. By combining luminous color with the materiality of handmade paper and graphic images, the artist entangles marine life with industrial debris in provocative reflections on destruction. Based in Chicago, interdisciplinary artist Maggie Puckett uses the seductive tactility of handmade paper in concert with rich organic color to foretell the dire effects of climate change. By working collaboratively, her work triggers environmental awareness that imbues socially engaged local actions with the power to impact the global. Pedestals, shelves, or cases provided by the venue. Pedestal bonnets preferred. Transport: Packed in reusable museum quality boxes / crates for freight climate controlled transport (53′ cab / truck) or FedEx Ground. Contact Reni Gower renigower53@comcast.net with your interest. Visual Arts Center, Boise State University, Boise, ID; Sep – Oct, 2018.